This entry was posted in car parking, hospital car parking, politicians on October 31, 2015 by Fatcontroller. Health Secretary Jeremy Hunt last year vowed crackdown on charges for visitors and patients, but 63 per cent have since raised their fees with one hiking prices by 960 per cent. Last night campaigners and MPs called for legislation to curb or even wipe out the charges. One of the worst offenders was Wye Valley NHS Trust, which raised its average hourly rate from 33p to £3.50 – a 960 per cent increase. 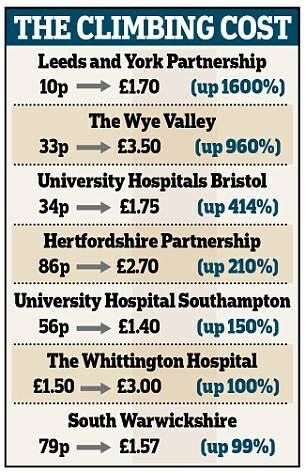 Whittington Hospital NHS Trust in London also angered patients, doubling its average hourly charge from £1.50 to £3. This entry was posted in car parking, hospital car parking, NHS on October 20, 2015 by Fatcontroller. Some in northern counties envy the Scottish benefits – but would they last? Listening to some of the televised debates one could take an implication that an independent Scotland would be able to make more things free. In reality we think it might be wise to keep hold of this list, and see how many remain after a few years of independence, and the facing of reality alone. I’d put a better chance on them remaining if Scotland decides to remain part of the Union. This entry was posted in Benefits, bus passes, car parking, Care of elderly, hospital car parking, over 60s, Prescription charges, Scotland on September 3, 2014 by Fatcontroller. Relatives of chronically ill patients must be given free or cheap hospital parking under new rules announced by the Government. Patients with disabilities and those with frequent appointments as well as staff working shifts will also benefit from the shake-up, according to Jeremy Hunt. The Health Secretary said new guidelines for English hospitals had been drawn up to put an end to the stress of “unfair” charges. Trusts should waive fines when an overstay is beyond the control of the driver, such as treatment taking longer than planned, under the reforms. Mr Hunt last month admitted he had concerns about the fees being charged to park at some hospitals after being pressed by Conservative backbenchers to put an end to the “rip-off” costs. The guidance sets out for the first time that hospital trusts are responsible for the actions of any privately contracted firms they use to run their car parking operations. This entry was posted in car parking, hospital car parking, politicians on August 23, 2014 by Fatcontroller. A Cabinet minister’s proposal to allow shoppers to park for 15 minutes on double yellow lines has been dismissed by a Coalition junior minister as ‘dangerous and unworkable’. Communities Secretary Eric Pickles, a Tory, suggested the scheme as a way to help ailing retailers. But transport minister Norman Baker, whose Liberal Democrat colleagues actually want to increase parking charges, claimed the plan would increase congestion and drive people away. But sources close to Mr Pickles argue that parking fines are doled out too eagerly, and are partly responsible for killing off the high street. This entry was posted in car parking, Local Councils, politicians on August 3, 2013 by Fatcontroller.